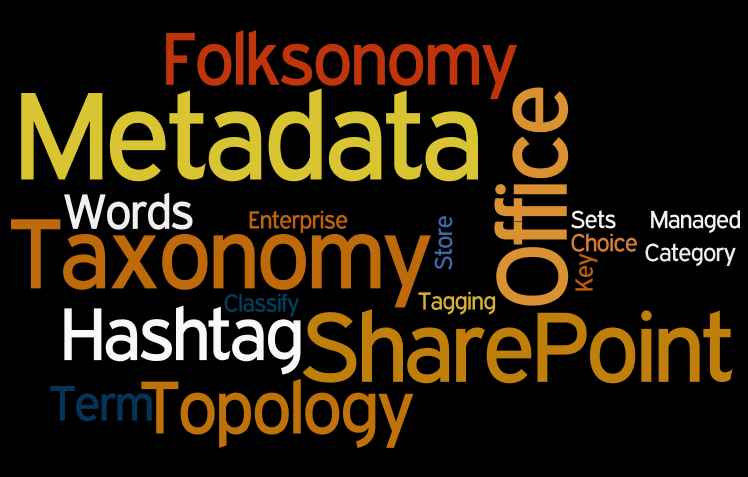 #Office365Challenge – Term Store Management in Office 365 Part 1 Terminology. The next couple of posts will be all about the Term Store in Office 365. As it is quite a broad subject and there are many considerations, we’ll start with what it is and the basic terminology. I’m definitely no expert on this subject and will be referencing many of the great articles Microsoft has already written about it. Keep in mind that the information is relevant whether on Office 365 (SharePoint Online) or SharePoint on-premises. Let’s get back to the basics first. Metadata. These are properties that can be assigned to content / information. Think of your own documents. They have authors, file sizes, modified date etc. In my blog Around the Office in 365 Days: Day 91 – Column Settings in SharePoint I explained the type of columns you can add in SharePoint, as well as the settings / validations on them. Single line of text – if you want to allow them to type whatever they want. Choice column – if you’ll never use that dropdown on another application or site again. Lookup – if you want to reuse it on the same site in different applications. Site Columns – if you want to reuse it on the same site and sub sites in different applications. Term Store – if you want to use it everywhere. I’ll be using the “Department Column” to get my point across. If you have an Intranet with 20 Sub sites on which you’ve built 20 applications each. That’s 400 applications and each of these has a choice column for Department. No problem with that, but: now the company makes changes to their departments and a couple gets added as well. You will have to go to each of those applications’ settings and modify that column to now be the same. Choice columns are not consistent as they sit on the specific app and has no relation to other columns. Get how painful that could be? When planning for categories (metadata) that will be used in more than one application, more than one site / department it would be wise to look at the Term Store. This allows you to manage the metadata in one central location, low effort to maintain and ‘reusability’ across your sites and applications. I always say the only difference between BIG words and small words, is the font size. For years I struggled with the methodologies and terminologies out there, as I did not consider myself part of the “educated” group, who actually knew what those things meant. Took me some time though to realise that what I do everyday, the practical side of things, aligns with the methodologies, I just didn’t call it that. So I’ll try my best to explain these to you in laymen’s terms – as I understand them. A category or property assigned to an item to give it more meaning and assist with classification / categorisation. It also assists with navigation to and search of content. This is nothing new, if you navigate to you Documents, Pictures, Music or Videos folder on your pc, you’ll see all those properties assigned already. Think of accounting, how we group certain accounts to categories, which then forms the bigger hierarchy of your accounting system – the general ledger, this allows you to form logical outputs = balance sheets / income statements / trial balances. Your company structure – departments / processes linked to them also forms a taxonomy. The arrangement of ‘things’ and how they are connected to each other. A file plan is a guideline that describes and documents the file locations, retention and archiving instructions, management of records as well as classification of documents. This normally goes hand in hand with the compliance regulations you might be following. This is part of your planning when it comes to your Term Store. Term Sets are the groupings used for Terms. Document Type could be the Term Set, where Policy, procedure, template etc. are the Terms. A great article to go read for more information is Introduction to managed metadata Thanks Microsoft! Now that we’ve covered most of the Terminology, we’re ready to start looking at the permissions needed for setting up Term Stores, which we’ll cover in tomorrow’s post.